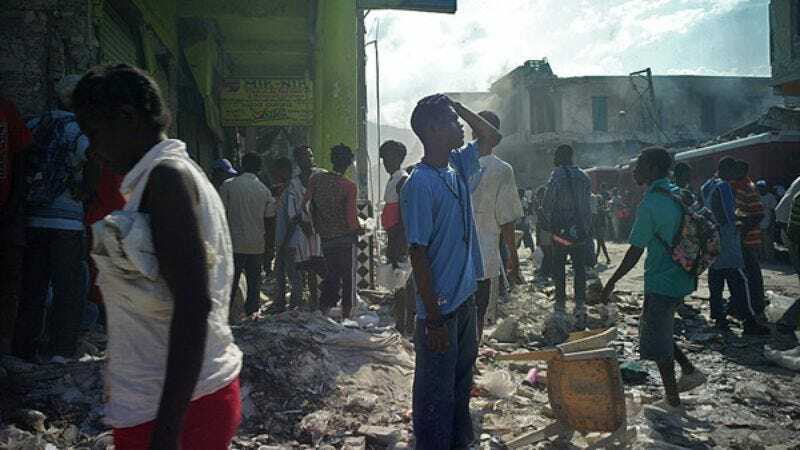 PORT-AU-PRINCE, HAITI—Less than two weeks after converging upon the site of a devastating magnitude 7.0 earthquake, American anthropologists have confirmed the discovery of a small, poverty-stricken island nation, known to its inhabitants as "Haiti." Researchers believe this was once the capital, though it's unclear if the Haitian people ever had a truly functional government. "That an entire civilization has been somehow existing right under our noses for all this time comes as a complete shock," said University of Florida anthropology professor Dr. Ben Oliver, adding that it appeared as if Haiti's citizens had been living under dangerous conditions even before the devastating earthquake struck. "Of course, there have been rumors in the past about a long-forgotten Caribbean nation whose people struggle every day to survive, live in constant fear of a corrupt government, and endure such squalor and hunger that they have resorted to eating dirt. But never did we give them much thought." Added Oliver, "Had it not been for this earthquake, I doubt we would have ever noticed Haiti at all." Though anthropologists said they still did not know much about Haiti's history, they claimed that, by observing the Haitians' reactions to this particular disaster, and studying the way the people had come together and taken solace in one another's sorrows, it appeared as if most of them were accustomed to tragic, even horrific, events. Researchers also came to the "startling" conclusion that Haiti's inhabitants must have at some point in their history been exposed to the English language, as many seemed capable of uttering such phrases as "Help us," and "Please don't abandon us again." "They are normal people just like you and me," said Harvard University's Aimee Coughlin, who before last week had never come across any mention of the struggling island republic, whether in conversation, on television, or while scanning the front pages of newspapers. "They communicate with one another, they have families and loved ones, and they value religion. However, judging by the way they are fending for themselves—a position they seem almost resigned to—it's clear these mysterious Haitian people don't have much else." "When we first landed there, I thought, 'No person could possibly live here,'" Oliver said. "Not only did the arid landscape look incapable of sustaining any sort of agriculture, but there was absolutely no infrastructure either. Had we known about this desperate, desperate place sooner, perhaps we could have shared some of our technological advancements with them." "I've vacationed just miles away in beautiful St. Kitts many times," Oliver added. "Never did anyone say anything about this Haiti place." Members of the world community were equally shocked at the discovery of such an impoverished civilization. U.N. representatives noted that Haiti's location puts it in the direct path of recent natural disasters such as Hurricanes Jeanne, Hanna, and Ike, disasters that probably caused massive flooding, disease, and death. "They must have had no way of communicating with the outside world, because had we known about these Haitians, we would have done everything in our power to help them," U.S. Senate Majority Leader Harry Reid said. "Of that I have no doubt."